Agilent’s (www.agilent.com) U1620A is the first 200 MHz handheld oscilloscope in the world to offer a VGA display, a floating measurement capability, three viewing modes and two CAT III 600 V isolated channels. With a maximum real-time sampling rate of two GSa/s and a memory depth of up to two Mpts, the oscilloscope enables users to capture more waveforms from signals such as in rush, pulse with modulated circuit, motor start up sequences and transient. It also features a dual window zoom and a benchtop-like display that allow users to easily locate problem areas and conveniently zoom in for a detailed analysis. Designed with a 5.7-inch VGA TFT LCD display, the oscilloscope provides users with a clear view of on-site as well as on the field measurements. 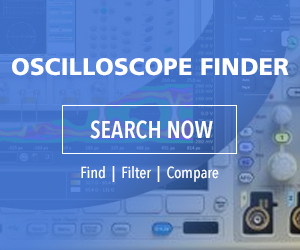 The oscilloscope also allows users to view the waveforms under all lighting conditions, as it offers three viewing options — indoor, outdoor and night vision modes. The indoor mode provides high brightness and contrast levels to provide users with a clear distinction of waveforms, while the outdoor mode features an anti-glare mechanism and filters out excessive sunlight to reduce the risk or misinterpreting or misreading the measurements. Designed to be visible even under subdued lighting conditions, the night vision mode offers high contrast levels between the waveforms and the screen background. Fitted with the most robust isolation topology, the U1620A oscilloscope enables technicians to perform floating measurements while measuring signals in the field.